This app does't just display the current temperature it also supplies current weather conditions as well. * The most beautiful and simple way to check for weather information on your iPhone and iPad. *You can search any country, city, village and even any street and find the necessary information. *Elegant design showing the day and night cycle. Due to the thermometer in the app it becomes possible to see the weather changes. * Real time weather information based on your current location(GPS or WiFi),wherever you are in the world. it is very useful when you are travelling. *Local condition report(with a stylish icon for each weather condition), temperature,high & low,wind,speed & direction,humidity level,cloudy cover. *Screen auto-refresh every 5 minutes with the latest weather information. *The temperature is displayed in celsius and fahrenheit. *Also you can move the map and bridge the destination and long press the place about which weather information is needed. *Pan and zoom the maps app. *The map will automatically find the appropriate imagery for your location. *Custom place markers keep track weather at different location -just add a place marker and the map will over the imagery for the location. IMPORTANT: This application requires an active internet connection to retrieve data.You also need to turn on "Location Services" options in the settings of your iPhone or iPad. If you lick this application, please leave us a review on iTunes. Your supports help greatly. 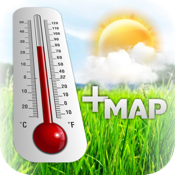 Thank you for taking the time to report any bugs or to request an enhancement to "Temperature+map" application.FeedBack is very important to us.We Will do our best to answer question. Email us at xpdavidx@yahoo.com.